Today on the Abiding Together Podcast, Sister Miriam, Michelle and Heather have another heart to heart conversation with our good friend Dr. Bob Schuchts. Dr. Bob is a family and marriage counsellor for 40 years and founder of JPII Healing Center. Dr. Bob shares about the 7 universal wounds in the human person that affect how we relate to others, ourselves, and God. He teaches about how those present themselves in our lives and how we can begin the healing journey that leads to freedom. You can find more about Dr. Bob’s ministry at https://jpiihealingcenter.org/ Dr. Bob’s book “Be Healed” - https://jpiihealingcenter.org/product/be-healed-dr-bob-schuchts-copy/ All his other books - https://jpiihealingcenter.org/shop/ Visit www.ascensionpress.com/abidingtogether to subscribe to the shownotes and receive them in your email every Monday! One Thing We Love This Week Sister Miriam’s one thing - Song “Come out of Hiding” Steffany Gretzinger Michelle’s one thing - Song “You Don’t Miss a Thing” by Amanda Cook Heather’s one thing - Shredded Buffalo Chicken Recipe (see recipe below) For the instant pot: * Add to pot - 3 lbs frozen chicken, 1 packet of powdered ranch dressing, * ½ - ¾ of a 17.5 fl oz bottle of Franks buffalo wing sauce (must be buffalo flavor) * Manual cook for 20 min. * When it’s done, do a natural steam release for 10 min, then manual steam release the rest. * Drain excess liquid if you don’t want it. * Add 3 tablespoons of butter * Shred chicken with 2 forks * Serve on buns or tortilla wraps with all the extras you enjoy. If using a slow cooker, add the chicken, buffalo sauce, and ranch package, cook on low for 6-7 hours, shred, then add butter and cook for one more hour. Discussion Questions What struck you from the podcast this week? How can we cooperate with the healing that God wants to bring into our lives? Who is a safe person around you who can speak truth to you, encourage you, and lift your gaze to the Father? Which of the 7 wounds do you resonate the most with in this season of your life? Journal Questions What is something you often overreact about that may be revealing a deeper area of woundedness? What mindsets or negative beliefs do you think you have brought from your childhood into your adulthood? Write down the 7 wounds that Dr. Bob mentioned. What is your first memory of when each of those wounds entered your life? Ask Jesus what He wants to speak to you about that. Quote to Ponder “Life comes through the heart” - Dr. Bob Schuchts Scripture for Lectio Divina - Isaiah 53:5 “By His wounds we are healed." 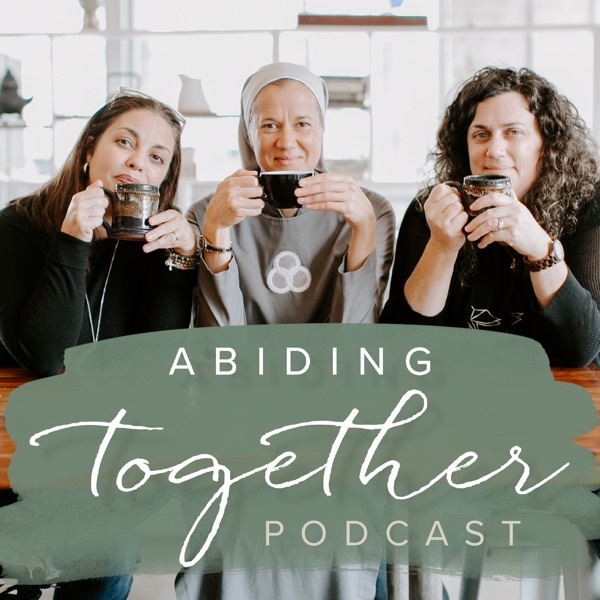 Today on the Abiding Together Podcast, Sister Miriam, Michelle and Heather talk with special guest, Dr. Bob Schuchts. Dr. Bob has been a marriage and family therapist for 40 years and is the founder of the JP II Healing Center. He shares about the five areas of intimacy in marriage and the role of healing and restoration in the places that have hurt that intimacy. Check out more info about Dr. Bob’s ministry (https://jpiihealingcenter.org/) Check out his books: “Be Healed (https://jpiihealingcenter.org/product/be-healed-dr-bob-schuchts-copy/)” “Be Transformed (https://jpiihealingcenter.org/product/be-transformed-dr-bob-schuchts/)” “Real Suffering (https://jpiihealingcenter.org/product/real-suffering/)” Visit www.ascensionpress.com/abidingtogether to subscribe to the shownotes and receive them in your email every Monday! One Thing We Love This Week: Sister Miriam’s One Thing - The playlist “Peaceful Classical Music (https://open.spotify.com/user/lougrubs1/playlist/7dEJpuaDZFbXWCWVfvtPEf?si=pTaFnSjpRUudUbWwib14NQ)” Michelle’s One Thing - The Netflix series “Call the Midwife (https://www.youtube.com/watch?v=aVfdZevxf_o)” Heather’s One Thing - Jake taking me to see Justin Timberlake! So fun. Dr. Bob’s One Thing - The book “The Same Kind of Different As Me (https://amzn.to/2ST2hAE)” Discussion Questions: 1) Which one of the 5 areas of intimacy do you struggle with the most? If you’re not married this still applies. (spiritual unity, emotional intimacy, daily companionship, cooperative teamwork, sexual intimacy) 2) What are the places that you need to work at keeping your heart open in relationships, when you feel the fear of being hurt? 3) How do you need to be more honest in your closest relationships? 4) What is the next right thing you need to do in your marriage (or closest friendship or personal life)? Journal Questions: 1) What issues from your childhood and dating relationships did you bring into your marriage (or will bring into your marriage or future vocational calling)? 2) How can I become more receptive to the love of God, so that I can share that more easily in my marriage or close relationships? 3) If you’re married, consider having the conversation Dr. Bob suggested. “What is the state of our union”? And use the 5 areas of intimacy as a guide. 4) Where do you need to offer forgiveness? Quote to Ponder: "Our most natural tendency is to try to get the other person to be what we need so that we can be loved well. Rather, to let go of that and just honestly love somebody, is when God becomes present." - Dr Bob Scripture for Lectio Divina - Ephesians 4:2-3 “Be completely humble and gentle; be patient, bearing with one another in love. Make every effort to keep the unity of the Spirit through the bond of peace” Next week we will begin our Lenten series on the themes of “Searching for and Maintaining Peace” by Fr. Jacques Philippe. This book is super small, but jam packed with wisdom. You don’t need to read the book to follow the podcasts, but if you’d like to read it, you can purchase it on Amazon. Today we continue our book study on the Lion, The Witch, and the Wardrobe Chapters 5-8. We reflect deeper on the story and how it relates to our spiritual lives. Themes such as the battle of light and darkness, jealousy and making others feel small, the power of the name of Jesus, surrender vs control and how the story of Narnia is an echo of what our hearts long for in Christ. Visit www.ascensionpress.com/abidingtogether to subscribe to the shownotes and receive them in your email every Monday! One Thing We Love This Week: Sr. Miriam’s One thing - The women from the “Undone” retreat https://jpiihealingcenter.org/events/undone-womens-conference-tallahassee-fl/ Michelle’s other one thing - The book “Just Mercy” by Bryan Stevenson https://www.amazon.com/Just-Mercy-Story-Justice-Redemption/dp/081298496X/ref=sr11?ie=UTF8&qid=1548091113&sr=8-1&keywords=just+mercy Heather's One Thing - Evangelization Ministry of Catholic Christian Outreach https://cco.ca/resources/faith-studies-series/ Discussion Questions: 1) What is one truth about God that you can see in your story? 2) Where do you need to grow into your royal identity as a daughter/son of God? 3) Discuss the truth about how the name of Jesus contains His presence. How could this change how you pray? 4) “He isn’t safe, but He’s good.” Discuss this quote and surrender vs. control. Journal Questions: 1) Who can you go to who can speak wisdom into your life? 2) Like Edmund, are there any places of your life that you feel fear when you think about God? 3) What parts of your heart have been turned to stone and need the warmth of God’s hand to bring them back to life? Quote to Ponder: "Safe?" said Mr Beaver ..."Who said anything about safe? ‘Course he isn't safe. But he's good. He's the King, I tell you.” - C.S. Lewis - The Lion, The Witch, and the Wardrobe Scripture for Lectio Divina - Revelation 21:4-7 He will wipe every tear from their eyes. There will be no more death' or mourning or crying or pain, for the old order of things has passed away. He who was seated on the throne said, "I am making everything new!" Then he said, "Write this down, for these words are trustworthy and true. He said to me: "It is done. I am the Alpha and the Omega, the Beginning and the End. To the thirsty I will give water without cost from the spring of the water of life. Those who are victorious will inherit all this, and I will be their God and they will be my children. Stories are powerful ways to communicate deep things of the human experience in a way that touches us and makes us more human. Jesus is the perfect example of being a master storyteller, making His truth and teachings relatable and personal. We discuss how we can open our spiritual eyes to stories and movies to see how they speak of the bigger story of salvation and the longings of the human heart. We also share about how our owning our stories is key. Visit www.ascensionpress.com/abidingtogether to subscribe to the shownotes and receive them in your email every Monday! One Thing We Love This Week: Sr. Miriam’s One thing - Clemson crushing Alabama in the National Football Championship Michelle’s other one thing - Fr. Mike Schmitt’s talk from the Focus SEEK Conference. Watch it here at minute 45:35 - https://youtu.be/ZcBidOcLUsc Heather's One Thing - Song “Highs and Lows” by Hillsong Young & Free https://www.youtube.com/watch?v=gEBOJMXqSdQ Discussion Questions: 1) What is your favorite story or movie that has parallels with the story of Salvation? Why do you love it so much? 2) Do you relate to the quote “for most of us, life feels like a movie we’ve arrived at 45 minutes late”? How connected to you feel to the larger story of Salvation in your daily life? 3) Have you ever wanted to take the pen out of God’s hand and write your own story? How do you need to grow in trust that He writes the best stories? Journal Questions: 1) What do you think is your role to play right now in the story of Salvation? 2) What movies or books do you love? How do those relate to the Story of Salvation? 3) How are you pursuing truth, beauty, and goodness in the stories and movies you consume? 4) What are three themes of your life story? What does God want to say about that? Quote to Ponder: “A story is a way to say something that can't be said any other way." - Flannery O'Connor Scripture for Lectio Divina - Psalm 139:13-16 For you formed my inward parts; you knitted me together in my mother's womb. I praise you, for I am fearfully and wonderfully made. Wonderful are your works; my soul knows it very well. My frame was not hidden from you, when I was being made in secret, intricately woven in the depths of the earth. Your eyes saw my unformed substance; in your book were written, every one of them, the days that were formed for me, when as yet there was none of them. Merry Christmas from Sister Miriam, Michelle, and Heather! Today the ladies of Abiding Together bring you a special minisode: A Christmas Blessing. Today we begin our 5 part series on the women Doctors of the Church by first exploring the life of St. Catherine of Siena. St. Catherine was a preacher, influencer, writer, miracle worker, and mystic. In this episode, we chat about Catherine’s example of intimacy with God, her fiery heart and voice of conviction, how her hidden life fueled her passion for the Church and restoration, and how we can follow her example in specific ways. One Thing We Love This Week: Sr. Miriam's One Thing - The Divine Mercy Shrine in Poland Michelle's One Thing - Brother Isaiah’s new song - https://aleteia.org/2018/10/17/brother-isaiahs-love-song-for-the-bride-is-balm-for-a-wounded-church/ and check out his album Poco a Poco Michelle’s other one thing - Rosary bracelet - https://chewslife.com/new-siena-rosary-bracelet-dalmatian-jasper/ Heather's One Thing - The St. Francis of Assisi Movie “A Sign of Contradiction” by Fr. Dave Pivonka and 4pm Media https://www.signofcontradiction.com/ Discussion Questions: What does restored femininity look like in your life? Where can you see God in your childhood? Where do you need to ask Him to reveal Himself? What do you love? What burns your heart? Where is Christ calling you to true love that radiates from within? Journal Questions: How is God inviting you to bring your feminine genius to your world? What suffering in your life is God asking you to unite with His, that He wants to restore and heal? How has the enemy come into my life to seek, kill, and destroy things that God wants to use to bring life and glory to the world? What areas in your hidden life within, need to experience mercy and transformation so that you can be a witness of restoration to the Church? Quote to Ponder: “I promise you, that, by this means, her beauty will be restored to her, not by the knife nor by cruelty, but peacefully, by humble and continued prayer, by the sweat and the tears shed by the fiery desire of My servants” - Jesus to St. Catherine of Siena *Scripture for the week - Ezekiel 37:1-7 * The hand of the Lord was on me, and he brought me out by the Spirit of the Lord and set me in the middle of a valley; it was full of bones. He led me back and forth among them, and I saw a great many bones on the floor of the valley, bones that were very dry. He asked me, “Son of man, can these bones live?” I said, “Sovereign Lord, you alone know.”Then he said to me, “Prophesy to these bones and say to them, ‘Dry bones, hear the word of the Lord! This is what the Sovereign Lord says to these bones: I will make breath enter you, and you will come to life. I will attach tendons to you and make flesh come upon you and cover you with skin; I will put breath in you, and you will come to life. Then you will know that I am the Lord.’” So I prophesied as I was commanded. And as I was prophesying, there was a noise, a rattling sound, and the bones came together, bone to bone.